Summer was a glorious fest of more sun than we knew what to do with, World Cup beers and a real opportunity to enjoy cocktails in the garden. If you’ve already been sadly contemplating putting the heating on, don’t despair: autumn is THE season for hot drinks and long walks. Whether you love a latte, crave a cappuccino or exist for an espresso, our latest free to enter competition is perfect for those who don’t want to (or can’t) sacrifice huge workspace areas for their beloved beverage. Compact in size and finished in black with silver accents, the Vivy 2 will fit seamlessly on to your kitchen work surface. 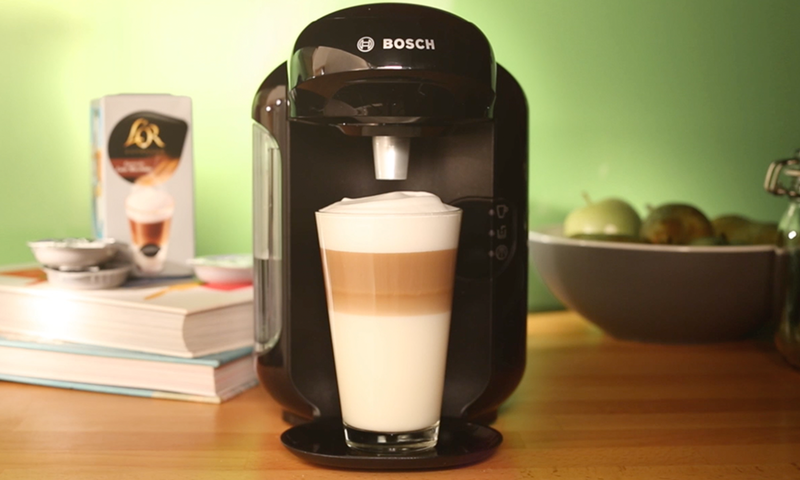 The Tassimo Vivy 2 from Bosch is the ideal machine for those who love a brew, measuring in at just 17cm wide, yet delivering a huge range of brilliant beverages in no time at all. 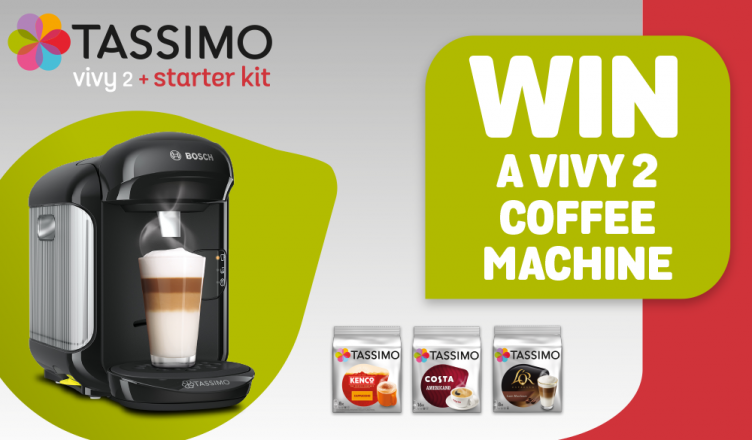 Read on to find out more about this wonderful prize and how you can enter the FREE competition to win your own Vivy 2 bundle, thanks to the kind folks at Tassimo. Not only will our winner receive a Vivy 2 coffee machine, but there’ll also be three packs of Tassimo T-discs AND a voucher towards your next purchase of T-discs. The Tassimo Vivy 2 is the small machine that is big on variety; with a range of drinks available from some of the favourite brands, you’ll find a host of drinks to suit you, friends and family. If you like to limit yourself to only two or three coffees a day, you don’t need to worry about the Vivy 2 gathering dust in the corner. Choose from coffee, cappuccinos, lattes, tea, chocolate and decaf drinks too; your favourites from expert beverage brands like Costa, Carte Noire, Kenco, L’Or, Twinings, Milka, Oreo, Cadbury, Tassimo and more. 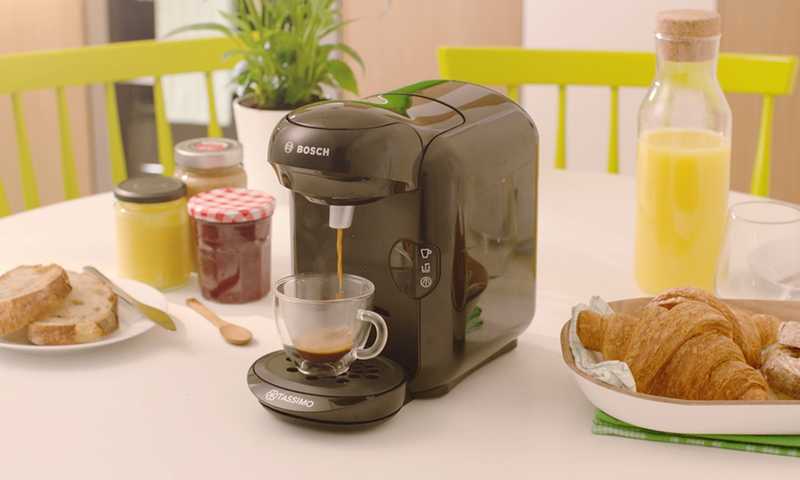 You’ll enjoy optimum drink quality every time you use the Vivy 2, thanks to Tassimo Intellibrew. Patented Barcode Technology ensures that each and every drink – from an espresso through to a creamy hot chocolate – is perfectly prepared every time. The barcode technology matches every element, from drink length and temperature with the perfect brewing time. With so much choice, making a decision is the toughest as preparing it has never been simpler! Just insert a T disc and press the button on the top right hand corner to begin the fully automated coffee-making system. Whether you’re in a rush in the morning or have a serious coffee craving you just can’t seem to shake, the Vivy 2 is ideal. The flow-through heater ensures that heat-up times are as quick as possible and you’re able to enjoy your hot drinks in no time at all. We have one brilliantTassimo Vivy 2 hot drinks machine bundle to give away to one lucky winner; to find out more and to be in with a chance of winning just head to our Facebook, Twitter or Instagram pages to find out how you can enter our brilliant FREE competition. You can also buy online, use our Click & Collect service to collect from your local store in as little as one hour or ask your local store about a demo or viewing our Bosch range.